Gummy Drop! Headquarters FAQ, Help & News! Finding yourself all gummied up? You’ve come to the right place! Here at Gummy Drop! Headquarters you will find the help you need! Gummy Drop! News. 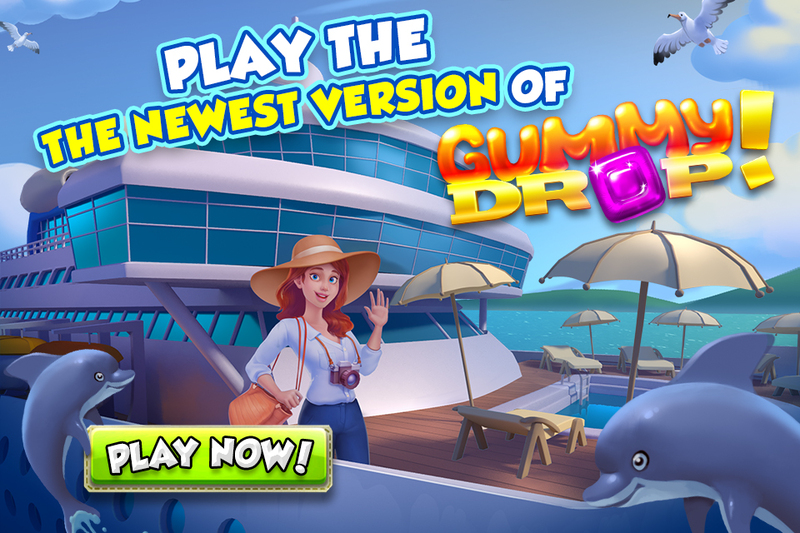 What’s new with Gummy? Gummy Drop! Videos & Video Guides! 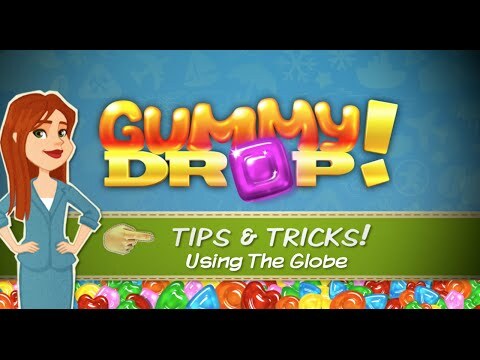 How To Use The Globe in Gummy Drop! How To Use The Shuffle Boost in Gummy Drop! 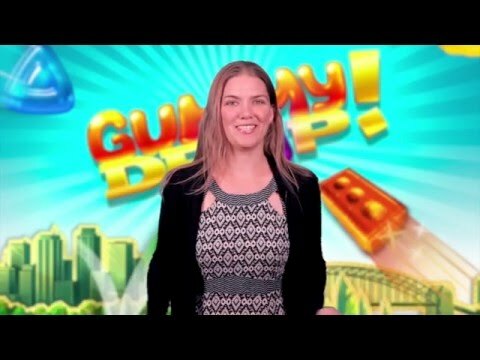 3 Reasons You Should Try Gummy Drop! Q: Why does each city have a different resource bank? They say you can’t take it with you – and that applies to resources you’ve earned in the game. You must earn resources in each city (except for Green Gems and gold). But your ship has come in! While resources can’t travel back to cities you’ve already completed, you can sail resources to any unlocked city. Q: Why are there letters on my levels? Welcome to the Daily Event – a little extra challenge! We’ll spell it out for you: You need to complete all the levels with letters within the time allowed (you’ll see the timer on your game board.) Your reward is extra resources or gold. Q: I’m out of moves! What happens if I choose to spin the wheel for more? Spin the wheel, and Fortune may smile upon you. 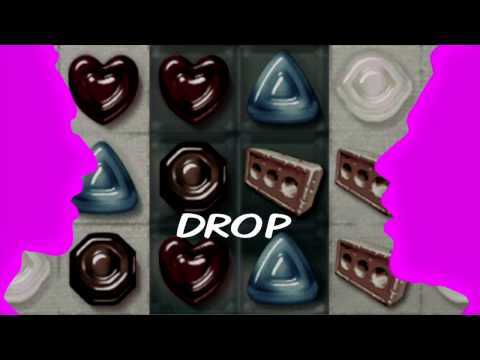 Land on 5 extra moves – and you’ll have a chance to win that level! Land on an extra life and you’ll gain one (you’ll lose the one you’re playing – but you’ll get another to try again). Land on travel vouchers – and you’ll get some! But if you land on a sad face (wah-wah! ), you’ll lose the level. Q: Why should I connect to Facebook? First – your progress in the game will be saved, no matter what happens to your device. Connecting to Facebook, Google+, or a Big Fish sign in will let you pick up where you left off if your device crashes – and you don’t want to suddenly find yourself back in Sydney, level 1. You can even log in to a different device, and keep playing at the same level where you stopped on an alternate device. You’ll also score daily Scratch Tickets you connect via Facebook. “Scratch” and match to win coins, boosts, or resources. You’ll receive 500 coins the first time you connect, among other rewards. And if you’re feeling extra generous, you can share your winnings with your friends list. Plus, if you’re stuck, your friends can supply you with 5 extra moves – and you can help them out, too. When you sign in, your friends become visible on the game map and leaderboards. Boasting about beating your friend’s progress on Facebook? Priceless. Q: I see a new city on the map. It looks awesome! Can I go there? You can! Earn travel vouchers by building monuments in your current city, and using those vouchers to unlock new cities. You can also purchase travel vouchers. Travel anywhere you like – take a quick vacation or opt for permanent access. Q: Why should I replay levels? When you replay levels, your rewards increase. Each level has three tiers of difficulty – Intern, Architect, and Master Builder. The higher the tier level played; the higher the reward upon completion. Winning the Master Builder level, for example, results in three times as many coins and resources as winning the Intern level. If you’re collecting resources to build that next monument, upgrade a Resource Mart, or open up more levels – replay previous levels at Master Builder. You’ll also get achievements for playing all the levels in a block of ten. You’ll also be asked to collect items for locals to move forward in the game – which sometimes require replaying levels at higher difficulties. Q: Why should I collect the little workers and other items? Collectables are valuable! If you collect the indicated amount of workers, for example, you’ll be able to build a Resource Mart – supplying you with extra resources to tap. Other collectables are necessary in order to move forward. Collecting paint cans in San Francisco allows you to complete the painted ladies – and you can only unlock the next levels after you’ve built them. Q: What are Green Gems? Do I need them to build the Green Gem Drill? Green Gems are valuable currency that must be earned by winning levels. Unlike other earned resources, however, you can carry them with you to new cities (along with gold). The Green Gem Drill is awarded right to you if you travel, or you can build it naturally in Tokyo. You’ll need that drill to build monuments – which, in turn, unlock levels. So if you build it – new cities will come! Q: I finished a city. Why isn’t it 100% complete in my passport? What happens at 100% completion? Q: I want to travel! How do I earn travel vouchers? You’ll be able to earn travel vouchers by building monuments (every 10 levels in every city). Every successfully built gives you a reward – when you collect the monument’s stamp in the Passport, that is. You can also luck into vouchers when you spin the wheel at the end of the level! Q: When will I see the Passport in my game? 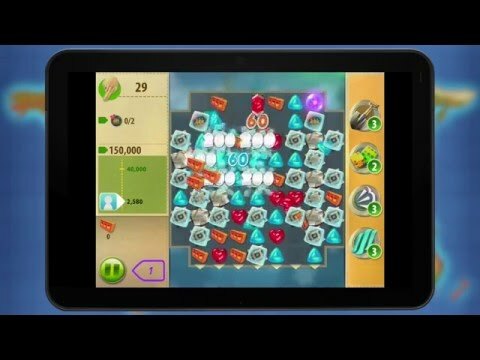 If you’re a new player to Gummy Drop! – welcome! You’ll see the Passport introduced once you complete level 10 in Sydney, and build the first monument to unlock level 11. No problem, just reach out to Customer Support and we’ll be able to help you one-on-one. If you’ve linked your game to a Big Fish account, please share the account’s email address. If you’ve linked your game to Facebook, please share your User ID.